This event is now closed for registrations. Welcome to the Virgin Money London Marathon guaranteed place application for Guide Dogs! All our spaces are now filled, so our applications are now closed. If any of our runners are unable to take part, we will contact those on the reserve list. If your application is successful and you accept a place with Guide Dogs, you will be asked to pay a registration fee and commit to a fundraising target. Join #TeamGuideDogs at one of the world's most iconic marathons - there's nothing quite like our incredible capital on marathon day! Make it count for Guide Dogs! Thank you for your interest in running the Virgin Money London Marathon for Guide Dogs! To apply for one of our charity places in the London Marathon please click the 'Register Now' button on this page and complete the application form. Enjoy the breath-taking views of our fabulous capital while making your way around the 26.2-mile course of the Virgin Money London Marathon. The marathon is famous for the multitude of participants running for charities, and the hordes of people lining the streets to cheer them on! It welcomes first time runners and elite athletes alike. A bespoke training plan and dedicated support from our Events Team in the lead up to race day. Already secured a ballot place? If you are one of the lucky ones who secured a ballot place in this year’s Virgin Money London Marathon, congratulations! We bet you're excited about joining thousands of other runners at one of the world's most iconic marathons. 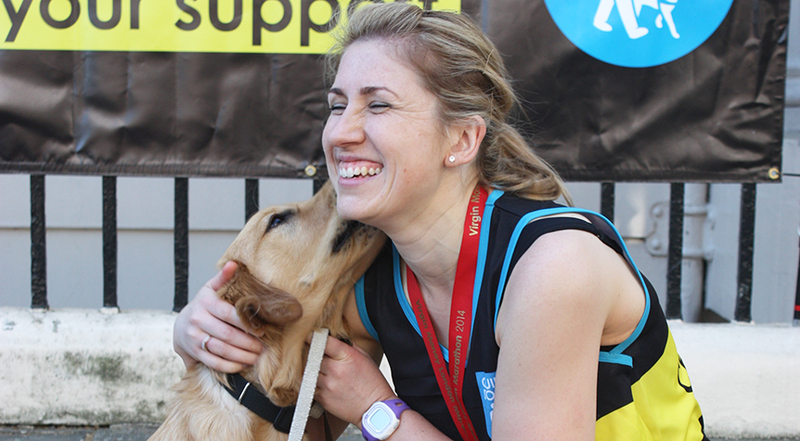 We'd love for you to make your ballot place count and run the London Marathon for Guide Dogs. As a ballot runner there is no fundraising target, and anything you raise will make a huge difference to people with sight loss in the UK. You will be able to enjoy all the benefits given to runners taking part in the spectacular event. Please visit this page to make your own place count for Guide Dogs at the Virgin Money London Marathon. For more information you can also call us on 0345 143 0200 or email our Events Team at events@guidedogs.org.uk - we'd love to hear from you! *Please note that where possible dogs will be at the post-race reception to greet our incredible runners - however, we cannot guarantee this as sometimes unforeseen circumstances mean the dogs cannot attend. © The Guide Dogs for the Blind Association 2018. Guide Dogs is a working name of The Guide Dogs for the Blind Association. Registered Office: Hillfields, Burghfield Common, Reading, Berkshire RG7 3YG.